Dive into our 5th grade science class with Mrs. Perry as students are learning about vertebrates. 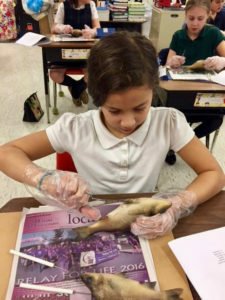 In this study of fish, amphibians, and reptiles, the students are dissecting a fish. First they have to label the external features of the fish on a diagram, and then they locate the structures on the fish. Next, they carefully dissect the fish to look for internal structures including its gills, swim bladder, and digestive system. “It’s neat to see the gills under the gill slit,” says one of our young naturalists.